As Thanksgiving approaches, I’m sure we all have one thing on our minds… leftovers. Oh, wait - You said, “Gratitude”? Well, ya know, I’m pretty gosh darn thankful for soooo much food that results in lots of leftovers. The week after Thanksgiving is the best. Plates are piled high, full of mashed potatoes, stuffing, and of course gravy! My mouth is already watering. I’ve hosted Thanksgiving for the last four year now, and I LOVE it! I love waking up early to set the table, chopping veggies while watching the parade on TV, and then sitting down to a delicious meal. You can get my entire Zero Waste Thanksgiving Meal Plan! I find Thanksgiving is pretty easy to keep zero waste if you focus on lots of fresh, local produce. The problems don’t start to arise until after the meal is over…. how on earth are we going to store all of the leftovers!? EEK! Even more of a conundrum…. how are we going to send home leftovers? Whether you’re attending a Thanksgiving Dinner or you’re the host, I’ve got some tips for you! If you're hosting. Think about serving the food in mixing bowls with lids. I have this set of four glass mixing bowls with lids*. The mixing bowls are simple glass bowls so they’re perfect for serving and storing. They seamlessly move from preparing food to serving food and then storing all your leftovers. They're aesthetically pleasing and can pass for serving dishes, unlike many other mixing bowls. I try to place all of my leftovers in glass containers so I can see what’s inside. If I store leftovers in containers where I can’t see what’s inside, I tend to forget about it and let the food go bad. It's no surprise that I love my pyrex snapware containers! * I talk about them all the time, and I use this set daily. Snapware is just incredibly functional. They're freezer and oven safe giving you a myriad of options. They're leak proof so I can easily take lunch with me on-the-go or get takeout without creating any waste. I LOVE my tiffins, but they’re not the most ideal for storing leftovers because you can’t see what’s inside of them. However, when Thanksgiving rolls around it’s time to break out the BIG tiffins. When I see these tiffins, I know there’s leftovers or takeout inside. It’s a four tiered tiffin* perfect for parties, leftovers, takeout, or even a large lunch! It really doesn't get much easier than putting the lid on it. If you've been cooking anything in a pot and have some leftover, just plop that lid right on the pot and store it in the fridge. I’ve even stored leftovers in my crockpot and salad spinner. If it’s got a lid, it’s liable to become food storage. You know when you load up a plate full of leftover goodies, but you just can’t finish? So, you put plastic wrap over the plate and put it in the fridge to heat up at a later time? Nix the plastic wrap and cover it with a beeswax wrap*! 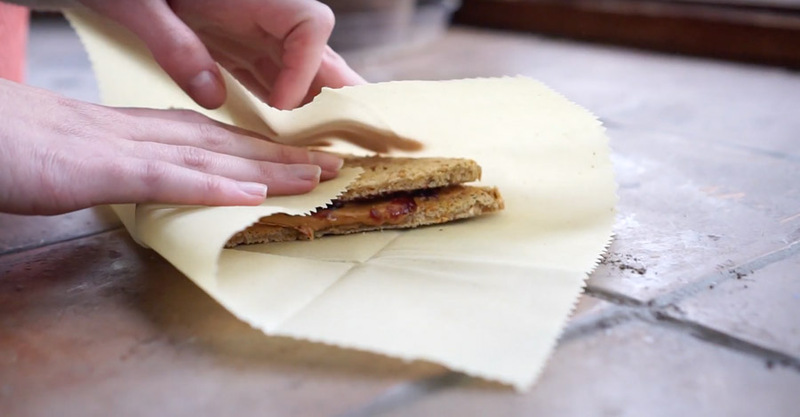 You can rinse the beeswax wrap and re-use it over and over again. Beeswax wraps also work great for wrapping up leftover bread or covering large pie dishes. If you have a bowl, you can place a plate over it and it acts just like a lid! Voila! It’s an instant and easy way to store small portions of leftovers. I have a drawer full of Stasher bags* and I especially love them for the freezer since they lay flat unlike mason jars. The bags work great for storing leftovers like rolls or roasted veggies. While you could put mashed potatoes or gravy inside, I’d probably save that for a jar unless you were going to be freezing it. They’re inexpensive, stackable, microwaveable, are leak proof, and they’re pretty easy to find second hand/come with food you might buy anyways like salsa or pasta sauce. I store a lot of my leftovers in mason jars because they’re so easy to come by. During the year I save all of the glass jars I get when grocery shopping to send leftovers home with people. If you’re afraid you won’t have enough, you can always call your friends and family and ask them to bring a tupperware container or two to your house to load up on leftovers when the party is over. If you’re a guest, then maybe stash one or two leftover containers in your bag or in your car. I personally, love this nesting set! Now that I live in a home with windows, I’ve become the plant lady I’ve always dreamed about being. I spend my weekends collecting new plant babes, watering them, and watching them flourish in our well lit, sunny home. For those of you not understanding my references to natural light and windows, check out my failed tiny home living experiment. We only had three windows so plant babes were not able to survive. Not having plants was really making me sad. When we moved, I actually threw a House Greening Party. A House Greening Party is when you ask all of your guests to bring you a new house plant to christen your new place. You can read more about my zero waste house warming/greening party. It’s full of zero waste party tips! In addition to all of my new plant friends, which I most definitely name, I bought several herbs from the local nursery. It’s super cool because the plants come in compostable pots! They’re not the traditional plastic pots. However, if you wind up with some of the plastic pots, you can always return them to the nursery where they’ll typically reuse them. Some of my herbs survived and some did not. To be honest, I don’t have a green thumb. This is my third time delving into the world of edible gardens and I have to say - third time is the charm! I say this because no matter how you feel about your gardening skills, I want you to give it a try. You don’t have to be perfect. You might kill some plants but having an edible windowsill garden is awesome for several reasons. You no longer have to buy expensive plastic clamshells full of herbs. You can save money by eating food you’ve grown! You can save carbon miles by eating what’s in your backyard. It’s so tasty, rewarding, and makes you happy! So, it’s better for the planet, better for the tastebuds, better for the wallet, and better for your mental and emotional well-being. I’d say that’s a win-win-win-win-win. Probably, the biggest string of wins on this blog. Now, I’ve picked up herbs, and I’ve also completely regrown my food scraps! Yes, you can regrow your food scraps. Check out my story highlight called lettuce and you can watch how I go from inedible lettuce stalks to having lettuce on tap forever in just 28 days. Here’s some herbs that do really well on the windowsill. Notice there are several herbs not on this list like cilantro and oregano. I have tried to go several of these on my windowsill and failed. They don’t do super will in small pots indoors. Plants like basil will let you know when they’re thirsty. They start to wilt, then you water and they perk right back up! The pots don’t need to be too big, just make sure that they have drainage. I’ve found that my herbs like to be watered much more frequently than my house plants just make sure that they’re not sitting in water. You can regrow a lot of other scraps, but I find that these work best for the windowsill! I’ve heard that you can grow lemons from lemon seeds, but I’m not sure if the fruit. I know that growing a plant from the avocado plant is popular, but I’ve heard that they won’t bear fruit. When regrowing scraps, you need to first start them in a cup of water. Make sure that the cup of water is changed every day or every other day. The cup doesn’t have to be completely full. You just need enough water for the base of the plant to be in about an inch. The scraps will start to regrow and once the roots sprout, you can transfer to a pot of soil. Just make sure the pot has drainage! If it doesn’t, you’re plants will probably die. I learned this the hard way…. The one thing that I’d really like to add to my windowsill garden is a big ol’ pot of spinach! It’s pretty easy to grow indoors with a shallow and wide pot. I will keep you up-to-date on my windowsill garden progress, and I really, really hope that you feel empowered to give one a try too! If you do, please let me know. You can tag me @going.zero.waste on instagram. If you’re killing it at windowsill gardening let me know in the comments down below. I would love any sage advice and I’m sure others will love helpful tips to get them started too.